As a freelance writer and independent consultant, I was surprised that learning and writing about mood disorders turned out to be so interesting. After living with my own mood disorder for more than thirty years, I have a personal interest. When I was sick with depression, I was ashamed and wanted to avoid the stigma of mental illness. I did not want to accept that episodes of mental illness were happening to me. I was not graceful and I did not cope well. I was upset. I craved the peace of mind which is so hard for mood-disordered people to find. Like any chronic illness, acceptance only comes after processing feelings of denial, anger, loss and grief. A depression survivor also has to work hard to learn the truth about depression symptoms, causes, diagnosis, treatment, and prognosis. After a long journey through darkness, I came out into the light. I learned to restore and maintain normal mood without adverse effects. I am motivated to share my information and help other depressed people. I consult about money matters, coach depression survivors and write articles and books. My focus is the depression survivor. 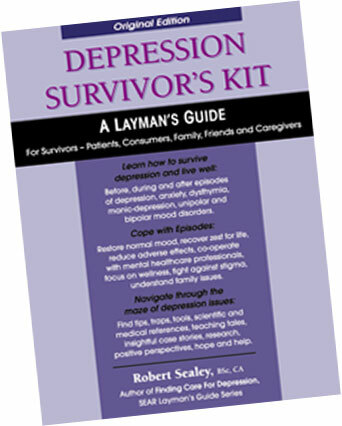 People often call for information about my Depression Survivor’s Kit . Some follow up with phone calls or meetings. Although I cannot fix other peoples’ brains or solve their problems, I consider myself richly blessed that so many people shared their reality with me. Depression and other mental illness episodes trouble many people. By the time people ask me for information, help and support, they are pretty well at the end of their rope. Most interesting to me as a survivor - writer - interviewer - consultant are the people who contact me as part of their search for effective healthcare for themselves or their relatives. They want helpful tips, survival information and practical guidance through the maze of depression symptoms and mental healthcare. I explain that as a writer - consultant - mood disorder survivor and Independent Depression Project coordinator, there are limits to what I can do. Undeterred, people pour out their stories in the hope that something good will come of it. I listen, sympathize, encourage and suggest people ask their psychiatrists and physicians for mental healthcare which is consistent with the practice guidelines of the psychiatric profession. I honestly believe that medical professionals are serious about accepting their responsibility to help sick people become well. Few mental healthcare professionals have experienced depression symptoms or the adverse effects of medications. Doctors are overloaded with cases of depression; hospitals are understaffed; and cost-cutting is a priority. Many doctors try to help their patients cope with refractory depression but few succeed. The sickest patients are lonely and unwell but they can still ask for restorative mental healthcare. Medical practice guidelines recommend in-depth diagnostic testing before the common psychiatric practice of labeling and drugging depressed patients. Many depressed people are helped by antidepressants, however adverse effects are commonly experienced. It is paradoxically painful to take one’s medications according to the advice of a trusted psychiatrist, only to get sicker and suffer the symptoms of depression as well as several adverse effects of pills. ‘Brain fog’ can envelope the depression sufferer. Already ill with up to 15 involuntary symptoms, a depressed person can feel helpless and hopeless when their healthcare professionals don’t offer a quick fix or explain that it takes time to diagnose and treat depression restoratively. It appears that many depressed people are not being diagnosed based on detailed medical or psychological tests and therefore the range of possible medical, biochemical, metabolic, genetic, developmental, psychological, social and environmental factors involved with their depressions are not being considered, tested, identified, or treated. After interviews with many middle class depression survivors, I still hope to learn that my perception on this point is wrong. I expected better quality care but I learned that restorative mental healthcare is an ideal that is apparently not always being offered by all mental healthcare professionals. When people wish to consider a second medical opinion or find restorative mental healthcare, I refer them to local healthcare professionals who can help. Little-known orthomolecular medicine appears to be consistent with the practice guidelines of the psychiatric profession and restorative mental healthcare. Even some traditionally-used European plant extracts can help but these are still medications and they need to be taken under medical supervision. I wish orthomolecular doctors could convince their skeptical conventional colleagues that restorative biochemistry can help depressed people recover normal mood without adverse effects. This sounds too good to be true so I will qualify. Each case of depression is different; there are no panaceas for depression; and even natural supplements can have adverse effects. By doing root-cause diagnostic testing and recommending supplements of natural vitamins, trace minerals, amino acids, precursors, energy and enzyme co-factors which are the body normally, there can be fewer adverse effects. Remembering how a few people helped me when I was looking for restorative healthcare, I wrote the Depression Survivor’s Kit to help other depressed people. Also available is the Orthomolecular Healthcare References - A Layman’s Guide to New Hope for Mental Health.